I use a lot of utilities. Up through the years I’ve registered many dozens of small and not so small shareware and otherwise distributed utilities. One of the earliest ones I actually paid for was back in the Windows 3.11 days, and it was ACDSee, a fast image browser with an amazing file format support. Back in those days, pretty much every program that used images had its own format, and pretty much everyone that worked with images had their own preference that they would send out images in. It was a mess. It wasn’t the first. And it wasn’t free. But it was small, comprehensive and it was FAST. There’s been many updates to ACDSee, and unfortunately most of them have not been for the better according to many of us long time users. But for a while ACD Systems also developed some interesting smaller utilities to make images more accessible in Windows, such as Image Fox (which would tag a preview box beside any standard Windows Save or Open dialog), mPowerTools, etc. 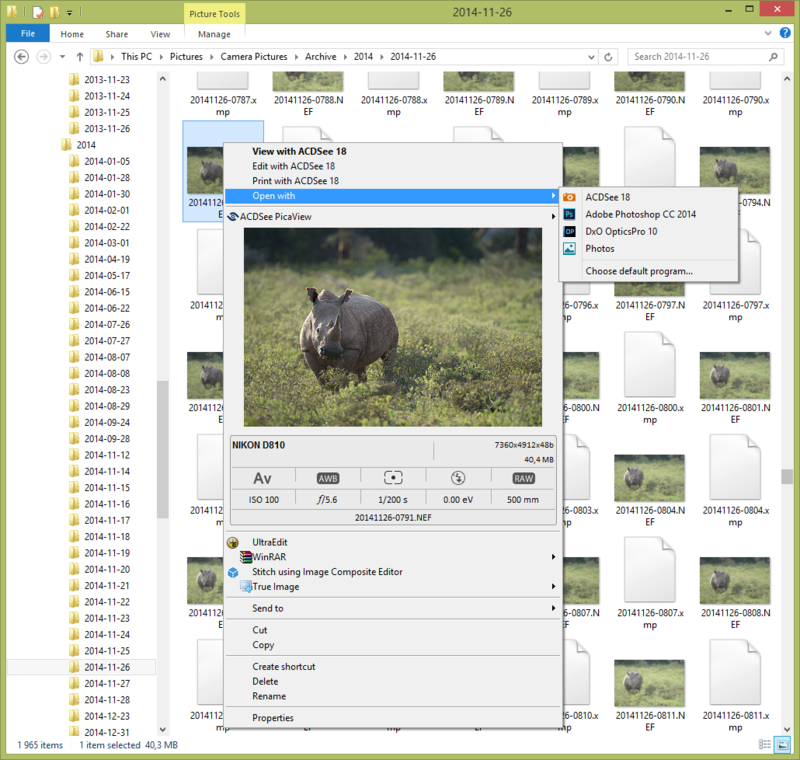 But my favorite companion to ACDSee was always PicaView, an Explorer shell extension that would let you right click any image in explorer and get a preview right in the context drop down menu with quick access to essential image data and functions. Unfortunately most of these utilities were discontinued long ago, some naturally because of improvements in Windows or in competing products, but when PicaView went away it always felt like there was an unfilled space. I’ve kept my ACDSee licenses reasonably updated through all these 20 years, skipping a version now and then. I even ran the big brother ACDSee Pro for a few years. But for the last few years I’ve felt that they’ve released new versions every autumn just to boost sales, with little or no benefit to us fans of the core functionality. If anything the “image browser” functionality kept getting slower and slower. So when a friend pinged me and said he thought the latest version 18 was faster with our 36 megapixel raw files, I was still back at version 15 and had stopped paying attention to what they were up to. I decided to give it a try. And while it does seem faster, the big surprise was the return of an old friend; PicaView is back as a feature of ACDSee 18! And there was much rejoicing. So what’s all the fuss about? Here’s a folder of raw files from my trip last year to Kenya. Normally I’d find my way around my raw files from within Lightroom, but sometimes I need to browse through them just quick on the road before they’re imported, or I’m accessing my drive from another PC. In these cases both ACDSee and Picaview comes in handy. PicaView lets me see a more detailed preview of the image and the essential shooting data without leaving the Explorer interface. Thanks for the clue dude !